HORTON — “The point of this talk really comes down to one thing,” said Sarah Swafford, looking out at the crowd gathered at the Brown County fairgrounds here Aug. 12. 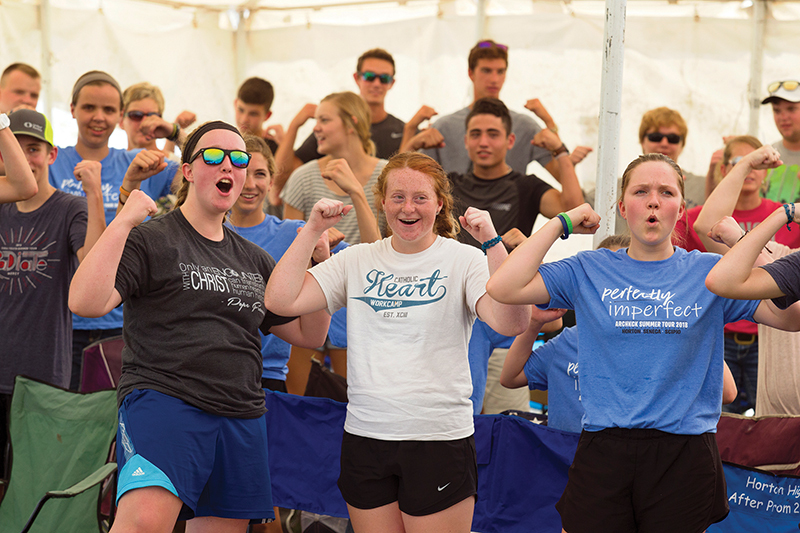 Swafford, an inspirational speaker on emotional chastity from Atchison, was the headliner for the Rural Youth Rally Summer Tour, which made its first stop in Horton, and would travel to Scipio the following weekend. Swafford spoke to high school students and their families about the false impressions of perfection that social media creates, the pressure it creates to date and the vital importance of choosing to love others rather than use them. “Right now, our kids need to hear the message of self-worth and that God loves them,” said Angie Bittner, the rural youth ministry outreach coordinator. The rally was co-hosted by St. Leo Parish in Horton. The afternoon included games, a dinner provided by the Knights of Columbus and women of the parish, and Mass, celebrated by Father Jeremy Heppler, OSB, and concelebrated by St. Leo pastor Father Dan Gardner. Jason and Ronda Smith have been bringing their family to the rally since the first one four years ago. “I love seeing our kids be engaged, have fun and to watch them actually listen to the speakers,” said Jason. “It helps us see them and the problems social media and society pose from a different view[point] and helps us guide them,” he continued. “We are educating the family here,” said Ronda, who is the youth director at St. Leo Parish. “With social media, you see families that look perfect, but it’s truly not the case. We are all human — and no one is perfect. For Kailea Smith, a junior at Horton High School, and Elizabeth Kettler, a senior at Hiawatha High, the rally is the much-needed segue from summer to the school year. “I’ve come to the rally in the past,” said Kettler, “and I always leave feeling refreshed and joyful. Recalling past “spiritual highs” she’s received after attending various retreats, Kailea said the rally is a reminder that her identity lies in her relationship with Christ. “Coming to the rally, you remember that you are enough,” she said. The rally also included performances by the Mikey Needleman Band. “You’re not going to have fun unless you’re open to it,” he said. Garrett Randel, a senior at Nemaha Central in Seneca, took that to heart. “Today has been really good because we’ve had a great time together,” he said.